A guide to charming, historic pueblos within two hours from Madrid. Roman aqueducts, fairytale castles and ornate cathedrals, these are only a few of the stunning sites to see in historic Segovia. Located just over an hour outside of Madrid, Segovia is part of the Castile-León region of Spain and is a UNESCO World Heritage site. The old part of the city is home to diverse, historic civil and religious buildings including the Aqueduct of Segovia, a Roman aqueduct dating from the late 1st century; the Segovia Cathedral, the last Gothic cathedral built in Spain in 1768; and the Alcázar of Segovia (pictured above), the royal palace that was built during the 12th century and is rumored to be one of the inspirations for Walt Disney’s Cinderella Castle. Seeing all these sites will require a lot of energy, so indulge in the local delicacy cochinillo (roast suckling pig) at local favorite Mesón de Cándido. 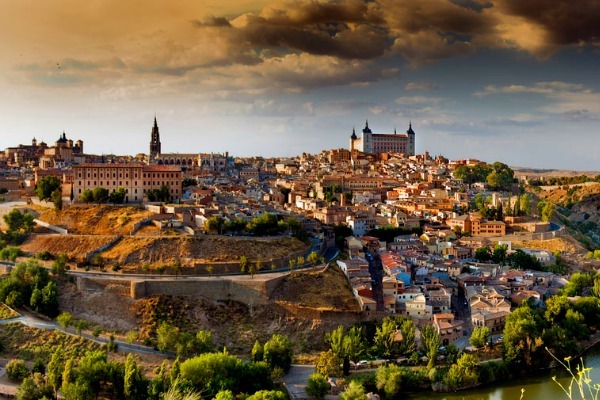 Game of Thrones fans will love the medieval city of Toledo, the former capital of Spain. Toledo is over 2,000 years old and was once the capital of the Visigothic Kingdom, and three of the world’s major religions existed here — Judaism, Christianity and Islam. The old city of Toledo is located on a mountaintop surrounded by the Tagus River, and it is home to many sites like the Cathedral of Toledo, which was built on top of a Moorish mosque and dates back to the 13th-15th centuries; and the Castillo de San Servando, a medieval castle near the Tagus River that began as a monastery in 1088 and was then converted into a fortress. Although Toledo is only a short one-hour drive from Madrid, if you choose to stay overnight, you won’t break the bank. A one-night stay at Fontecruz Toledo, the only five-star property within the city walls, starts at $135/night on the weekends. El Escorial is the easiest destination to visit from Madrid as it is accessible via a 40-minute trip on the Cercanías, Madrid’s commuter rail service. El Escorial is characterized by one major architectural complex, the Royal Site of San Lorenzo of El Escorial, which is comprised of a church, monastery, royal palace, college and library. Art aficionados will love the interior of El Escorial, complete with works from master painters like El Greco, Luca Giordano and Claudio Coello. El Escorial is also a UNESCO World Heritage site and is the most-impressive monument of the Spanish Renaissance. 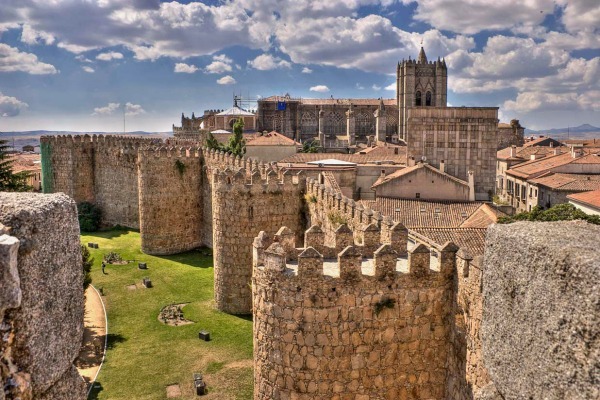 Continuing down the list of UNESCO World Heritage sites outside of Madrid is Ávila, known for its amazingly intact wall that surrounds the old part of the city and was built during the 11th century. Don’t miss the opportunity to see this wall completely lit up at night, showcasing the power and intimidation factor it held years ago. Ávila is also known for being the birthplace of Saint Teresa of Jesus, a prominent Roman Catholic saint and theologian. Travelers to Ávila can visit the Convent of Santa Teresa, which was built on top of her birthplace and features sculptures from master sculptor Gregorio Fernández. While visiting the convent, make sure to support the nuns by purchasing their delicious sweet biscuits, chocolate and cakes that are sold at the convent or at all the local shops.